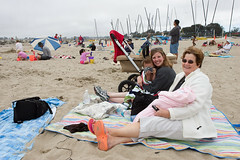 We visited the beach in Santa Cruz with Moma Lynn. It was a beach adjacent to a small harbor with sailboats docked in the background and people sailing around the ocean. Matthew enjoyed running around in the water for the first time. We started out running around with me constantly holding his hand. I would pull him up when the wave is about to wash him away. He soon gained his boyish confidence and wanted me to allow him to run without my hand there to rescue him. He fussed and nearly threw a tantrum every time I tried to hold his hand. So I allowed him to run around. I carefully positioned myself to catch him should the waves wash him over. Sure enough, a wave washed him over so that he was swept off his feet and completely submerged. I quickly plucked him out of the water. As I look up, I can see the life guard was intently watching us from his station. Jenn and Lynn where also watching. Matthew was shivering and grasping on to me, spitting out the salty water. Afterwards, he didn’t want to let go of me for a second. We spent more time running around in the water, but it was me running and Matthew clenching his arms and legs securely around me. Here’s a photo of Jenn, Matthew and Lynn. Matthew is warming up from his cold encounter with the ocean. Claire is a full time eating and sleeping baby. She’s really a sweet and peaceful girl. There’s just those few precious moments when she’s awake and attentive. Those are the times I like to give her kisses, talk to her, and coax a smile from her. 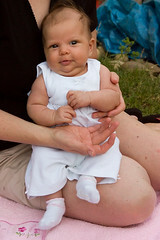 Here’s a photo of Jenn holding Claire in her beautiful white Sunday best. Click here to see all the photos in the set here. Laura visited for a week and we spent a Saturday in San Francisco enjoying the warm 75 degree weather while it was around 90 degrees back in San Jose. We’re never certain how much trouble it will be to travel with 1 month old Claire and 2 year old Matthew. But this trip was actually very fun. 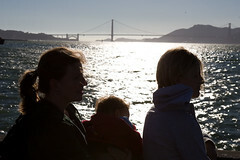 Here’s a photo of Jenn, Matthew and Laura on the pier near with the Golden Gate bridge in the background. We started out parking at the usual Sutter St. garage and walking down towards Market St. where we planned to eat at an awesome Mexican food place called Chipotle. They are a move towards more organic and sustainable raised food. They call it their Food With Integrity (FWI) program. The pork they use is from pigs that roam naturally and are not raised in CAFO (Concentrated Animal Feeding Operations). Most of the beef and chicken are sourced from all naturally raised sources. Over time they try to slowly move more and more towards using completely organic and naturally raised foods. Matthew loved a simple side dish of their marinated, shredded pork and rice for only $2.50. He consumed nearly all of it! All of their food is incredibly good and the prices are comparable to other Mexican food places. If you go during the lunch hour, you’ll find a line going out the door! There are a handful of Chipotle’s around in California and the number is continually growing. I have to thank God that one just opened up a couple blocks away from my workplace! After lunch, we headed towards a popular park near the San Francisco Museum of Modern Art. Matthew spent a good 20 minutes playing around the multilevel fountains with pathways and walkways to explore amongst the fountains. On our way back to the truck, we stopped to listen to a violin and guitar play some folk style music on the sidewalk in front of the Men’s Macy’s. They were young girls who actually happened to be from a Christian family that was visiting San Francisco. The open guitar case that they had placed on the ground offered tracks that tell about Jesus. After much people watching, a stop to feed Claire, we finally made it back to the truck. Then we fed Claire some more before hitting the streets of San Francisco. China town was just a block away, so we drove up the center of China Town, slowing making our way down the very narrow st. Tourists and Chinese people filled the sidewalks. We soon remembered about the excellent pearl tea drinks that are available in China town, however, the parking is horrible and there were no parking spaces open. So I parked my truck temporarily halfway on the sidewalk and halfway in the street. Jenn and Laura jumped out to fetch the pearl tea drinks. Meanwhile, I sat in the truck with the motor running and wondering if I my parking my gigantic SUV partly on the sideway would be a problem. People walked right by my truck, staring at the buildings, looking at the stores and other people. A police officer on bike appeared around the corner and headed down the street towards me. His eyes were scanning the crown and the traffic but he didn’t for a second notice me partly parked on the sidewalk. Another compact car came and jerked itself onto the sidewalk in front of me. At this point I was feeling like it didn’t really matter that I was parked here. So I turned my truck off and relaxed. Jenn and Laura soon returned with the treats. Laura, having experienced pearl tea drinks in China, knew what the good stuff was supposed to taste like. She had yet to find good pearl tea in the U.S. except at this place in San Francisco. It was yummy good. Actually, there are a number of good places in the Bay Area to find good pearl tea. In San Francisco, it’s always fun to ride the hilly streets and experience a real live roller coaster with buildings and scenery of San Francisco surrounding you. Today was no exception. I quickly found several nearby streets that go up and down and we had a few thrills with those. But I knew there were something more dramatic and as we followed the top of the hill, I peered down the side streets and spotted a extremely steep dropping street. You know it’s very steep when rooftops of the buildings disappear very quickly. As we approach the steep street, it’s just like going over the crest of a hill on a roller coaster. The ground drops away and all you see is air and the sides of the buildings. As the truck meets the steep grade of the street all the passengers experience their seat belts being the only thing holding them into the seat! It was so steep that Matthew wasn’t even saying “weee!” This particular experience was unusually comical in that as we approached the cross street on the following block, a little old lady with a cane was patiently making her way across our path. Thankfully my breaks were working well that day. James Boice has an excellent litmus test for false teachers. It’s very practical and simple. His premise is based on Jesus words that tell us the good tree will produce good fruit. So the good teacher will produce good fruit in their disciples, and the false teacher will produce bad fruit in their disciples. Or put another way, the good pastor will produce good fruit in their congregation and the false pastor will produce bad fruit in their congregation. Here’s James Boice’s summary. Let me put it this way. Does the teaching you are receiving satisfy your soul? Does it bring you closer to God? Does it equip you to live for Jesus Christ at home and in your place of work? Does it make you less selfish? Does it prompt you to help and serve other people when you have an opportunity to do so? If it does not, find teaching that does. Find a place where the teaching takes root and flourishes in growth and spiritual satisfaction. The only instruction that will ever satisfy you in this way is accurate Bible teaching. Boice, J. M. (2001). The Gospel of Matthew (114). Grand Rapids, Mich.: Baker Books. Jenn and I are thankful that we can say yes to many of these questions. West Hills Community church in Morgan Hill is an excellent place to call our church home. If you are not in a church that prompts you to produce good fruit, then what are you waiting for?